You may have noticed that I fell in love with every kind of asian food whilst in San Diego. It was so prevalent there and so many of the recipes I cooked were some type of asian food. I craved it, all the time and I'm still have withdrawals for my favorite sushi place down there Ki Sushi. So here is another restaurant post, this time in a college dining hall! I absolutely could not believe my eyes when I walked into this restaurant/dining hall the very first time, because it looks like a modern, fancy restaurant. I only had 2 chances to try the food at this place, but each time was fresh, and delicious. They have a sushi bar or sit down tables. 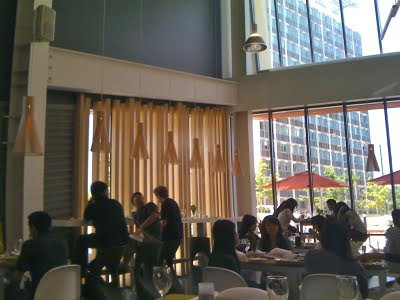 I highly recommend making a reservation if you want to try the food here, because they are only open M-Th from 11-3! The prices are relatively cheap and they accept dining dollars or TritonCash if you attend UCSD. They give you a fancy bottle of tap water for your table, so you never run out. 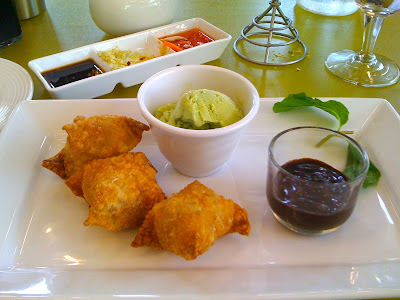 They give you some tasty wonton chips with several dipping sauces before your meal. I am still upset I never had the chance to try the Ahi Avocado Poke appetizer, but everything else I tried was delicious. 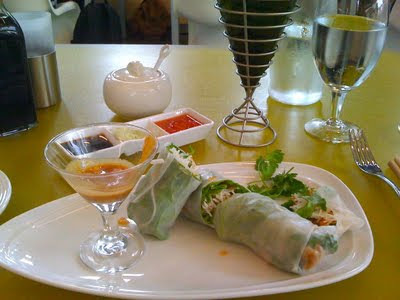 Here are the Chicken Fresh Rolls, after I already dug in! This was the Banana Turon with Green Tea Ice Cream, so refreshing! All I can say, is that I hope this is the way dining halls are going in the future. The architecture was so modern, yet strange, but the service was so professional and quick. And the food was innovative and new for a dining hall. If you ever get a chance to try the food at The Strand, do it! Here's the inside. That building in the background is part of the transfer housing, which is where I lived during my Junior year at UCSD. They hadn't built this restaurant until my Senior year, which is partly why it was so hard to get over there, plus classes conflicted.